I was almost certain that I was going to love this book even before turning the first page. Having already read Eleanor & Park and Attachments by Rowell, and having thoroughly enjoyed them both, I had extremely high hopes. I wasn't let down. Cath is off to university, reluctantly. Her and her twin sister, Wren, have always down everything together and whilst they are both heading for the same university, Wren is adamant that they will live separate lives. Wren wants her independence, she wants to have her own friends, live her own life. But Cath isn't sure how to function without her twin sister by her side. Cath struggles with social anxiety and dislikes change and without her twin by her side, everything is made all the harder. She immerses herself in her love for writing fanfiction and takes to not leaving the room she silently shares with roommate Reagan. Slowly she builds up friendships. Reagen, Levi, Nick. Whilst she throws her fanfiction characters into exciting situations where they experience danger and love among other things, she struggles to so the same for herself. Preferring to remain within the four walls of her room, pouring her thoughts into her laptop. The problems arise when change is offered and Cath has to decide whether she is ready to live her own life, meet new people, have new experiences or if she wants to remain safely within her own head, accompanied by her thoughts. The brilliance of this book lies in its characters. Cath presents the nervous teen heading off to university, leaving behind a dad she doesn't necessarily want to say goodbye to. The alternative side is shown through the character of Wren who couldn't be more enthusiastic about the freedom university will bring her. I could relate to Cath on many levels. Having started university three years ago and now coming up to the end of my degree, I can remember the fear of starting afresh as though it were yesterday. I could sympathise with Cath when she chose to avoid going out in favour of delving into a fictional world that gave her comfort. Cath is an entirely relatable character, I felt as though I knew her because it was almost as though I was her. Of course, there is no use in having just one solid character and thankfully Fangirl was full of them. I loved the contrast between Cath and Wren. How their similarities and differences were equally striking. Reagan too offered a good contrast to Cath and I really enjoyed watching their friendship grow, it was an unlikely friendship but that was what made it so interesting. Nick was another interesting character and although ultimately he was a minor character, I felt as though Rowell devoted enough time to developing his personality such that he wasn't merely an afterthought. Often I find that authors neglect their minor characters, Rowell was not guilty of this! Finally, I cannot discuss characters without mentioning Levi. Charming and happy go lucky, he was very easy to like. Again, it was very interesting to see his friendship with Cath grow and the interactions between the two of them were touching and entertaining in equal measure. What I liked most about Levi was how normal he seemed to be. Rowell seems to have a knack for writing down to earth, relatable characters and her books are all the better for it. The story line moved at a suitable pace; not too fast, not too slow. It represented a realistic university experience. On one hand the girl who falls too easily into a pattern of never leaving her room and the other a girl who immerses herself into the party lifestyle. It was in all a bit predictable but it never set itself up to be anything else so I can hardly fault it for that. I really enjoyed this book, once I picked it up, I didn't put it down. I wouldn't hesitate to recommend it. 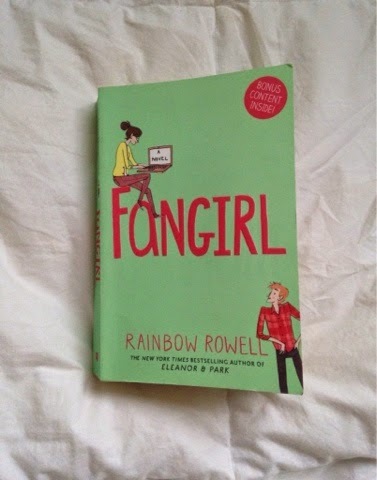 Let me know in the comments your view on Fangirl and I would love any recommendations of similar books!